Squidward has moved away with no forwarding address, and SpongeBob and Patrick must scour the globe in search of their best buddy. And what better way to search for a missing friend than taking a long bus trip and yelling "Squidward" out the window nonstop? 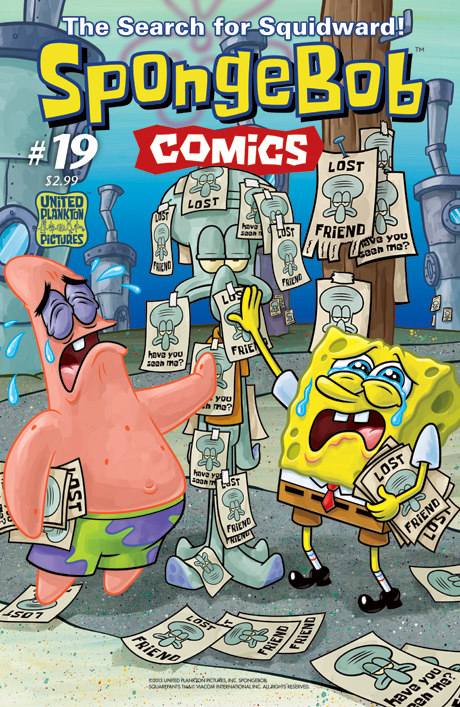 It all happens in "Farewell Squidward!" And in "Monstah Lobstah Cometh," Mermaid Man and Barnacle Boy remember their first encounter with a deadly, but delicious, foe. All this plus a 4-page doodle comic, a tense shopping moment with Mrs. Puff, and the secret to Squidward's most perfect clarinet performance.